Now in truth this great work was peculiarly suited to God’s goodness. 1. For a king, having built a house or a city, if he finds it attacked by bandits because of the carelessness of those who live in it, does not neglect it and ignore the situation, but he will avenge himself and reclaim it as his own property, not thinking of the carelessness of the inhabitants, but of his own honour. How much more did God the Word of the all-good Father not neglect the race of men, when he saw His own creation falling into corruption. But, while He destroyed death which had taken place in the offering of His own body, He corrected their neglect by His own teaching, restoring all that was of man’s nature by His own power. 3. Then He also points out the reason why it was necessary for none other than God the Word Himself to become incarnate; saying: “For it became Him, for Whom are all things, and through Whom are all things, in bringing many sons unto glory, to make the Captain of their salvation perfect through suffering;” by which words He means, that it belonged to none other to bring man back from the corruption which had begun, than the Word of God, Who had also made them in the beginning. 5. For by the sacrifice of His own body, He has put an end to the law which was against us, and made a new beginning of life for us, by the hope of resurrection which He has given us. For just as it was from man that death gained control over men, in the same way, the destruction of death and the resurrection of life have come about by the Word of God being made man. As the man who bore Christ says: “For since it was by man that death entered into the world, it was also by man that the resurrection of the dead came. For as in Adam all die, so also in Christ shall all be made alive:” and so forth. For no longer now do we die as subject to the condemnation; but as men who rise from the dead we now await the general resurrection of all, “which in its own times He shall show,” even God, Who has also brought it about, and given it as a gift to us. 6. This then is the first reason for the Saviour’s being made man. But we might see from the following reasons also, that it was appropriate for His gracious coming among us to have taken place. How does St Athanasius begin this chapter? It is by stating that the coming of God as man to destroy the power which death had over mankind was entirely appropriate to the goodness of God. It was this essential goodness of God, the Lover of Mankind, which led him to desire the restoration and renewal of that state which had been lost by Adam’s sin and in which we find ourselves. There is indeed a divine honour which has been offended. But the offence is not that of man, but of the enemies of God and of death. If God has been infinitely offended it is not man who has offended him, and therefore it is not man who owes any restoration of his honour. What does St Athanasius say? It is that God is dishonoured by those spiritual forces which assault his own possession, mankind, and he will restore his own honour himself by destroying his enemies and would himself restore all that had been proper to mankind at the beginning. He offers his own body to death, not to the Father. And he does not restore the divine honour by bearing the punishment of the Father on our behalf, but rather by destroying death himself in experiencing it for us. What is to be said about mankind? It is that we are careless in our defence of that which God had made. But God is not concerned so much with our carelessness, which he overcomes by destroying death and corruption, teaching us that which we had neglected, and restoring to us what he had given at the beginning, life in union with God. He is more concerned with those who have brought about our downfall, and with the power of death which has been established over us. These he eradicates by his own power. 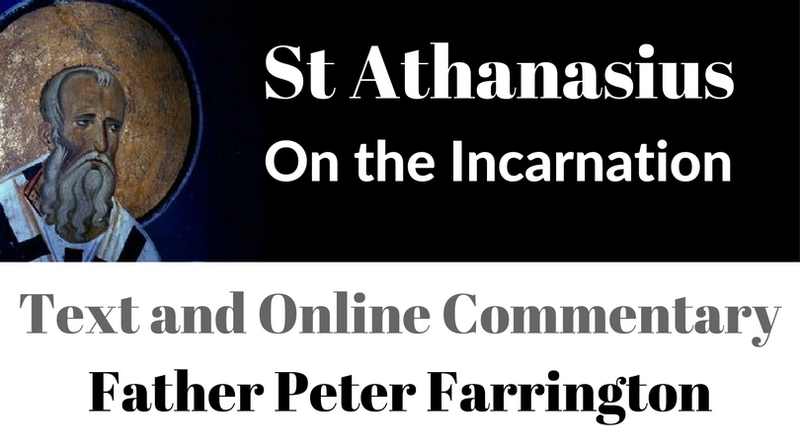 St Athanasius turns to the Scripture as the source of his understanding. It is because one has died, that all of us have died in him. Having died for all, the power of death is spent, and by his resurrection, life in union with God is offered to all. He tasted death on behalf of us all. He was not punished by the Father, as if the Father was not filled with love for mankind, but he experienced death on our behalf so that united to him we might not be bound by the power of death any longer. Why was it necessary for God the Word to become man on our behalf? It was especially because since it was the same Word of God who had made all things in the beginning, it was proper and fitting that he should also renew all things by is becoming man. What had begun with creation is renewed by a recreation, and a renewal, in the incarnation of the Word of God as true man, while remaining God. There was another reason why God the Word became man. It was so that being like us in all things except sin, he could destroy the power of death and the devil which has such a hold over men and women such as ourselves. If he was to destroy death by experiencing it then he must have a body which was able to suffer and die. And if he was to offer himself up to death on our behalf then he must be like on of us in all things. Therefore he truly became man. He was conceived of the Holy Spirit and the Virgin Mary and was truly born as a human infant, while remaining God and the Lord of all, the Sustainer of all things. He did not become man to suffer God’s wrath and anger, there is no mention of this at all. Rather the Consubstantial Trinity, Father, Son and Holy Spirit, in love, were in complete and essential unity of will in this loving and gracious act of incarnation which would defeat death and corruption and restore the possibility of union with God. Here is the Good News. By his incarnation and his offering of himself to death in his own body, he has overcome that law which said – if you eat, then you will die. This was never the punishment of God, but was always the consequence of turning from life and light. Adam had eaten, and so he brought upon himself the consequence of death and corruption. And not only upon himself but upon all his children and descendants. The Word of God, Jesus Christ, has come to undo this consequence by experiencing it himself and destroying it by his own divine power. We have already seen that the consequence could not just be put aside. Everything had changed when Adam sinned. But it could be overcome by one who was both human and divine, liable to the consequence but life himself. All of us are made alive in Christ. He has dealt with the consequence of Adam’s sin. Adam caused us all to experience mortality and corruption. Christ unites all mankind in life and frees us from the condemnation which fell upon Adam. All mankind will be raised from the dead because of the death of death in the resurrection of Christ. And this resurrection of all is given as a gift to all by God who has brought it about in love, and not with any anger or hatred towards those he created in love. There are other reasons why God the Word became man. But St Athanasius tells us that these will be described in future chapters.